as captured by 5th grader Shelby Yin. Do you want to know more about Mrs. Peterson? Well if you do, then read on to find out more about Mrs. Peterson. You can also get a preview on what the book fair will be like, and get to no some things that would be sold! Mrs. Peterson was born in Oklahoma City, and lived there for six months! After that, she moved to Southern California. Then she got married and moved to Seattle with her husband. Since then, she still lives in Seattle, Washington. Mrs. Peterson also went to the UW. 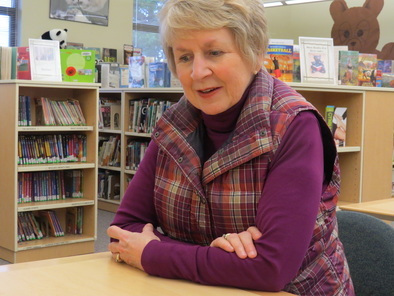 She has been a librarian for twenty years, that’s also how long she has been a school librarian. Everyone has a favorite book and author…so does Mrs. Peterson! Her favorite books are so awesome that if you read them, they will most likely to be one of your favorite books too! Here are Mrs. Peterson’s current favorite books are: Petey, written by: Ben Mikaelsen, and Counting by Sevens that Holly Sloan wrote! Some of Mrs. Peterson’s favorite authors currently are Candace Fleming, Kirby Larsen, and Ben Mikaelson! 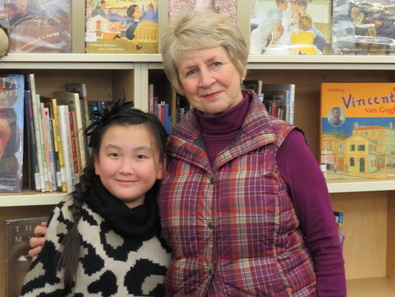 In the school library, Mrs. Peterson wants: “I Wish I had more interesting historical fiction books that more kids would want to read, and I also want more interesting biographies that more kids would also want to read!” Said Mrs. Peterson. She also wants more I survived series (written by: Lauren Tarshis) because that book series is really popular, and the books are based in historical events! Have you ever wondered what made Mrs Peterson want to be a school librarian and what it takes to be one? Well, you can find out how now! To be a librarian, you need one year at literature class and you need a bachelor’s degree. Why Mrs. Peterson wanted and likes being a librarian is because she loves seeing children learn, improve and grow throughout the years of time they are at Woodridge Elementary. That is also her favorite thing about being a school Liberian! She also really loves books! Speaking of books, the annual book fair is coming really soon to Woodridge Elementary. Mrs. Peterson predicts that Dork Diary’s, Minecraft, and Star Wars books might be selling the most at the book fair! There will be plenty of fun books and exquisite things like, bookmarks, pencils, pencil sharpeners, erasers and much, much more cool stuff, and books await you at the “Under the Sea” themed book fair, which starts on March 3rd, and ends march 5th! Class: Mrs. Ropposch's 5th grade class!